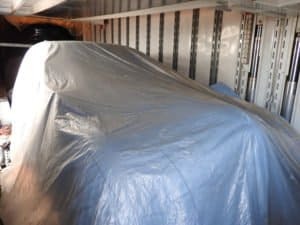 Most people know that there are major differences between shipping a car on an open trailer and an enclosed trailer, but there are also many differences amongst the enclosed auto transport services companies offer. We, the experts at Intercity Lines, created this guide to help educate you on the differences between services and the questions you need to ask before shipping a car. If you do a google search for “auto transport” or “shipping a car” you will primarily find brokers in the results. Auto transport brokers are something that most people are not aware of when they ship their first car. So what exactly is an auto transport broker? They are companies that do not own their car hauling equipment and instead bid out your shipment to a group of carriers who own their auto transport equipment. Auto transport brokers typically take the lowest bid, and the difference between the two is their commission they receive for shipping your car. 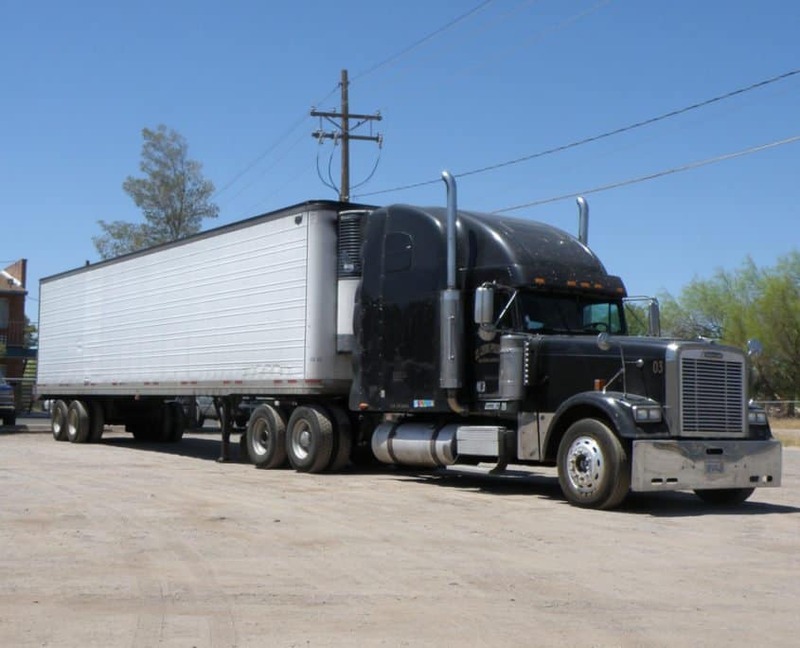 When doing business with an auto transport broker, you do not know what auto transporter or driver they are going to broker your order to or the level of car hauling experience that the company has. Unfortunately, customers often suffer at the hands of these auto brokers because the cars are shipped with sub-par drivers that lack customer service, proper equipment, and auto transport skills. 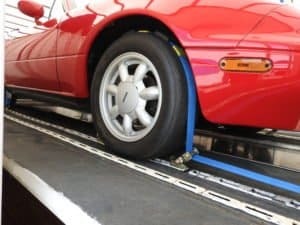 Using car hauling ramps and hydraulic lift gates are the two common ways companies load vehicles on to their enclosed auto transport trailers, but there are major differences between the two that affect the safety of your car. Car hauling ramps are cheaper than hydraulic lift gates, which may decrease the cost of shipping your car. However, ramps are a risk to low clearance vehicles due to the possibility of scraping the underside of the car during loading due to the steep incline of the ramps. Some drivers may use blocks of wood in addition to the ramps to help lower the incline, but the wood blocks can shoot up, after the car rolls off of them, possibly hitting the car. 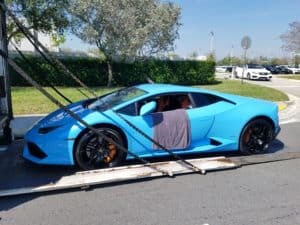 Also, an inexperienced driver could damage the clutch trying to drive the car slowly up the steep ramp; especially on vintage exotics like Ferraris and Lamborghinis. Another risk of loading a vehicle using car hauling ramps is that the vehicle may slip off the ramps causing major damage if they are not perfectly aligned, secured, or if they are slick due to inclement weather. Hydraulic lift gates, like the ones equipped on Intercity Lines enclosed auto transport trailers, are the safest way to load a vehicle and act as an elevator for the car during loading and unloading. They lower completely flat on to the ground, so low clearance vehicles can easily drive on to the ramp without the risk of scraping the undercarriage. They also give the driver much more control over the car. Instead of the driver being forced to gun it up two thin ramps he can slowly drive it on to the liftgate and then off the liftgate. There are no inclines that require heightened acceleration, and the driver can get out, put wheel chocks behind the wheels, and slowly load the vehicle on to the trailer. Hydraulic lift gates are more expensive than ramps, which may increase the price in exchange for the added safety of the car. This added cost also shows how serious the company is about the auto transport business. Intercity Lines was the first major auto transport company to adopt hydraulic lift gates and continue to set the standard for the auto transport industry to this day. Vehicles are either secured inside auto transport trailers using nylon straps or chains. Chains are one of the riskiest ways of securing a vehicle for transport. They are typically secured over the frame or axle of the car. This compresses the suspension and puts a lot of strain on the car especially if they are overtightened, which can lead to damage. If the chain loosens, it can bang against the car over every bump and pothole for the remainder of the trip. Nylon straps are the alternative to chains, but how they are used makes a big difference. Nylon straps can secure a car by going over the tire or through the rims. Going through the car’s rim has the risk of damaging the rim of the vehicle. Intercity Lines secures vehicles by running the nylon straps over the rubber of the car’s tire posing no risk to the car or rim while still securing the car in place. Intercity Lines’ nylon straps only touch the rubber of the tire. When chains are used they are often secured to the frame of the car and are winched down to tighten them. This put’s immense strain on the vehicle and suspension. If the chains were to get loose they could potentially turn into heavy metal banging against your car during transport. 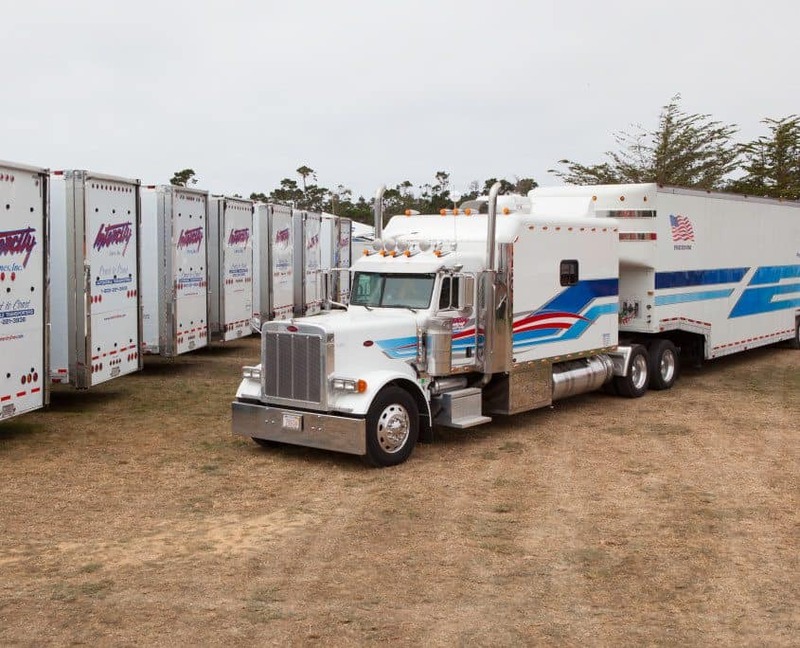 Enclosed auto transport trailers protect vehicles from physical damage like tree limbs, rocks, etc. They also protect the car against the elements and dirt. Top of the line carriers like Intercity Lines put a towel on the door during loading and unloading to prevent the driver from touching the paint of the car. 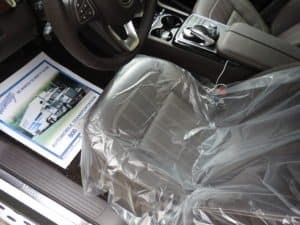 Using seat covers and floor mats ensure that the interior is not dirtied or damaged during the loading/unloading of the vehicle. Covering a car with a cloth and plastic car cover protects the car from dirt, oil, & fluid leaks from the cars above. At Intercity Lines, we take all of these extra steps, which can be seen below. never touches the car’s paint. Cover each car with a plastic and cloth cover. Not all auto transport companies have the same level of insurance coverage for your vehicle during transport. 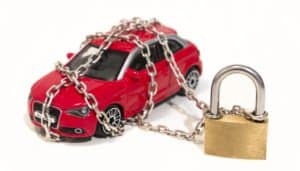 Auto transport companies that have not been around very long or ones that have a high numbers of claims may not be able to get the same level of insurance coverage as a company like Intercity Lines. When speaking to different auto transport companies it is important to ask how much insurance coverage they carry for your vehicle. Intercity Lines carriers $2 million worth of cargo insurance that covers your vehicle from the time it is being loaded to the time it is being unloaded. At Intercity Lines, we’ve spent years perfecting the transportation of automobiles. As our business has grown, we’ve remained focused on providing the best value and the best customer service to every one of our clients. We stay in front with customized enclosed auto transport equipment, advanced communication technology, innovative services and highly trained and enthusiastic employees. Our business has grown through thousands of satisfied customers. Our goal is to exceed the expectations of every customer, every time we have an opportunity to serve them.